Tower Grove East Community Garden, 2002. 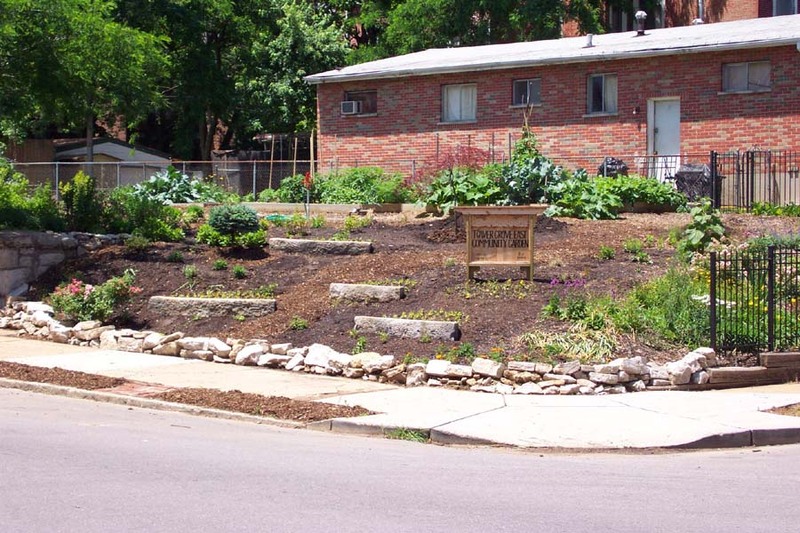 Written by Mary Anne Pikrone, Tower Grove East Community Garden Leader. 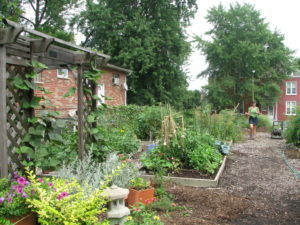 Three and a half years ago, as my husband and I were taking a get-acquainted drive through the neighborhood we chose to live in, we came upon folks working in the Tower Grove East Community Garden. I’d given up backyard gardens in Richmond, VA., and Toledo, Ohio, and was prepared to do with just a postage stamp yard behind our new location on Louisiana Ave. So I walked into the garden, asked about available beds, and within a couple weeks, I was happily planting tomato seedlings in my new plot a half block from where we moved. It made me feel at home again. Meanwhile, I kept hearing about Gateway Greening but didn’t really understand what the organization was. I did note our sign said the garden was established by GG in 1999– long before I moved here. I got more involved in the Tower Grove East Community Garden, and that’s when I came to appreciate what a wonderful resource Gateway Greening is. I visited their headquarters and took the required course for garden officers. I attended their early spring conferences, where I learned community gardening techniques and met others who are just as passionate about urban gardening as I am. And, best of all, I discovered Gateway Greening’s volunteer services. Tower Grove East Community Garden, Summer of 2008. Frankly, we wouldn’t be where we are today–nor would we look as good–if it were not for the volunteers Gateway Greening has sent us. We’ve had folks from Minnesota who mightily struggled, and prevailed, in 90-degree weather under brutal sunlight; they weren’t used to such heat. We’ve had seminarians and families who’ve helped us. We’ve had up to several dozen people–I call them worker bees–who have descended on our grounds, worked furiously in often very hot weather and left the place neat and clean. I must say the most impressive were the high school track team girls (can’t remember from where), who conquered deep roots that our gardeners hadn’t been able to budge. Yes, I have to say they definitely out-weeded the guys. Then, late last year, Gateway Greening arrived with much-needed tools to refurbish our tool shed. What a gift! Now, of course, I hope to apply for a new arbor/trellis from them. When I have friends visit, I always give them a tour of the garden and explain about Gateway Greening, a wonderful umbrella organization of more than 200 urban community gardens. Meanwhile, we’re determined to keep improving the garden. Thanks to Alderwoman Christine Ingrassia, the city installed new sidewalks and replaced ancient steps leading up to the garden this fall. We paid to have our 100-year-old plus retaining wall tuckpointed; it had been cracking and chipping. It’s great to know Gateway Greening has our back.